A knife made of ceramic? I have never heard of ceramic knives until recently. How strong is ceramic? Why is it even crafted into a knife? According to the Mohs hardness scale, a properly made ceramic knife will be rate about 8 with diamond as the hardest scoring a ten. Stainless steel gives you a rate of about 5. Now, that's something. Being one of the hardest material on earth does have its advantages. For one the ceramic knife is so hard it can literally slice and slice and slice for years without the need to resharpen. And they don'trust, pit or corrode which suits me just fine since I don't really upkeep my tools. However, I am aware that ceramic may be HARD but they are fragile as well. One drop and the blade will chip. Hence, it is better to keep them in proper places after use. 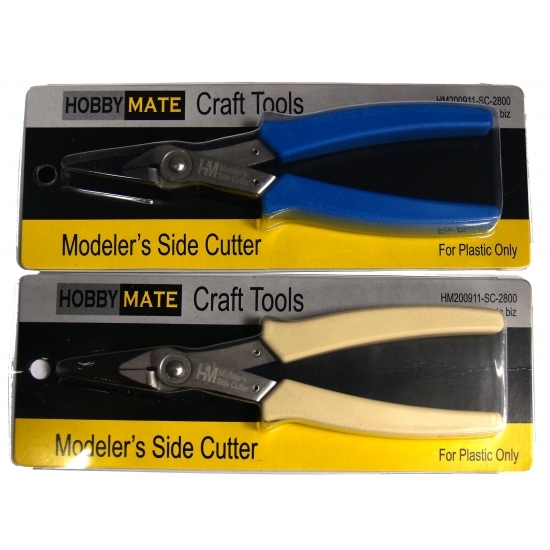 You can't cut or chop with these knives but they are ideal for chamferring and deburring for plastic kits. Some updates. I have been PAINTING for like one month? Too much distractions of course. Somehow when it comes to painting SDs, I tend to lost motivation fast. I am probably used to big projects than a quick fix. But I'm digging in and will try to finish this before CNY. I tried a dark base for the white and a bluish tint will give it a sinister look. It looks "primed" at this stage but that will be rectified when I apply panel lines and hand paint some parts. 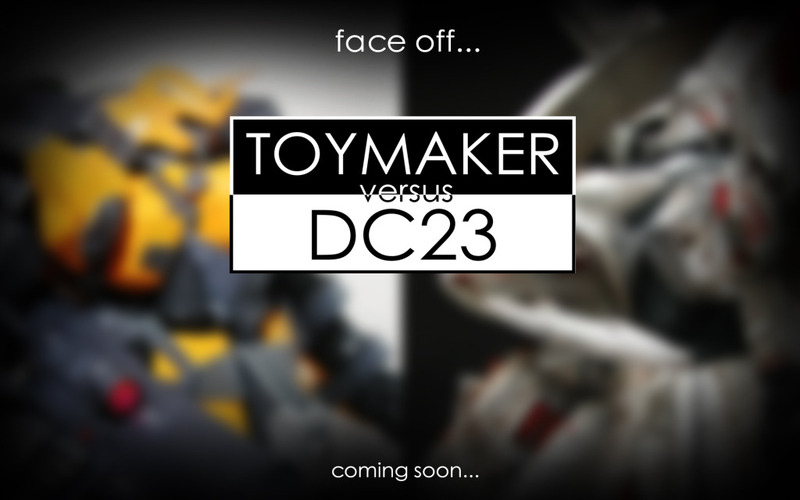 DC23 verses Toymaker, a proposal that was thrown to me by who else but Mr Donc himself. 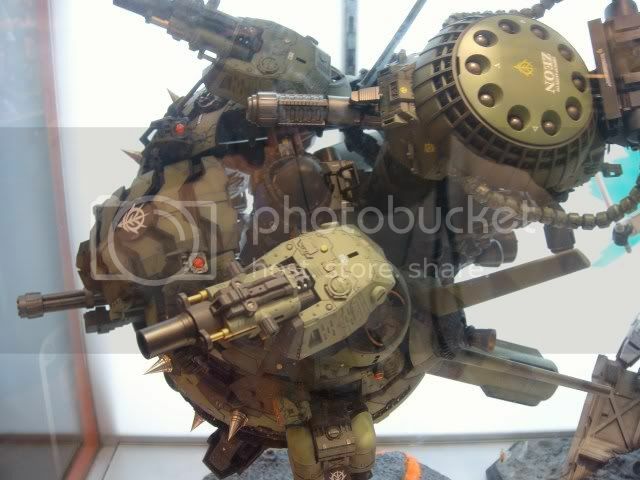 A talented modeler from the Philippines, he has won several awards most notably, the overall champion for BAKUC in 2008. You can viewed his winning entry here He is also the creator of Dc23 Mecharts, a popular blog dedicated to his hobby. Well, by mere coincidence, the both of us had the intention to work on the same kit (details coming). So he suggested we have a build-off. I had to agree to it. Since both of is are so different in terms of concepts and styles, it would be interesting to see his take on that kit, as compared to mine. 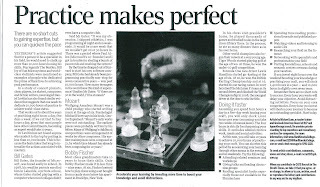 Yesterday, I came across this interesting article in the Straits Times about gaining expertise. It is said that for a person to be a specialist in his or her field, he or she needs to accumulate more than 10,000 hours honing his/her skills. So if we are to use four hours day and five days a week, we will achieve "expert" status in ten years. That got me thinking,"is this applicable to Gunpla modeling?" I did some mental calculations and after being around this field for almost nine years, I think I have more or less hit that figure. But I ask myself," can I then be considered a expert in this field?" To be frank, I am not entirely convinced. 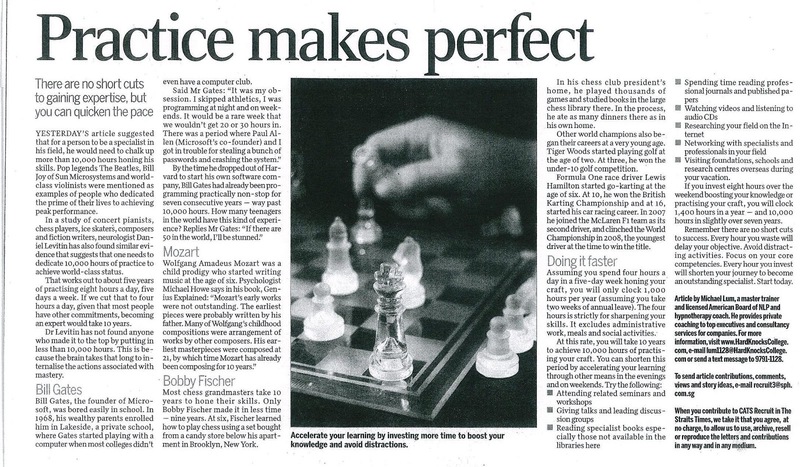 The article went on to talk about well-know people like Bill Gates, Mozart, Bobby Fischer (a chess grandmaster), Tiger Woods and even Lewis Hamilton. All of them share some similarities, most of them started very young, devoted a large part of their younger days pursuing their interests. And most importantly, their unwavering determination to master the craft. So what kind of determination am I talking about? Well, four hours is too short to do anything. In the first few years, I put in at least five hours a day. In fact, I am still doing that now amid other activities. The internet also provides me with valuable information I need to try a technique. I always believes that experience doesn't comes from "what I told you" but by trying new techniques, making errors and learning from them, YOURSELF. Reference books, resources and magazines were so rare those days and I have to pay a premium for them. Fast forward a few years and you have "live" demonstrations available on YouTube, modeling forums and even hobby shops offering courses. A wealth of information at your fingertips. If you ask me, you don't need to put in 10,000 hours to be an expert. I am not really a huge fan of Transformers and I do not owe one myself. But I grabbed this the moment I saw it, despite the hefty price tag. And while fiddling with it, I thought I could take some pictures and share with you guys. My first impression of this kit is its size and weight. Slightly taller than the Sinanju, it weighs like a Perfect Grade gundam. I am amazed at the attention paid to details. 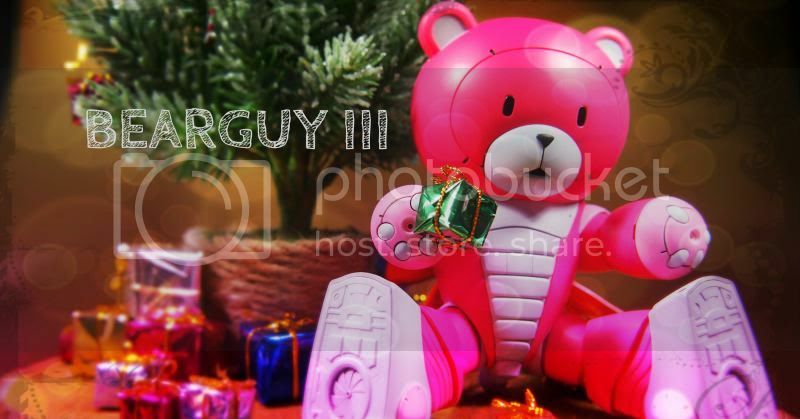 It does't look that toyish anymore and almost like a replicate from the movie. I'm back from Hong Kong! The BMKWC Finals was a blast and we were very very lucky to win the Group category. The other entries were terrific and I will share with you guys later. Now, I will present to you, "TRINITY". A collaboration between 5 fellow modelers with Leon as the "Director", Sam, Erik, Jaef and of course, me, we started as soon as Shengtai announced BMKWC and introduced a Group category. Naturally, we were fired up. Leon wasted no time in gathering members and never looked back. As this is our first ever group build, we wanted something really special. But to me, it's like stepping into the unknown. I have no idea what to expect and how to co-ordinate. 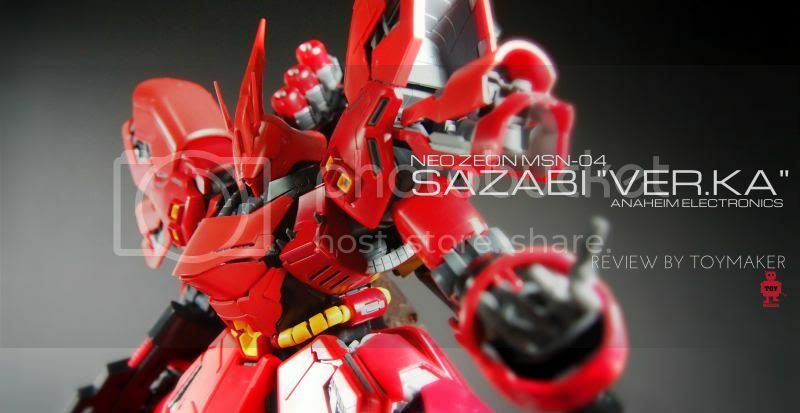 When he proposed three variations of the Sinanju, I was like,"Sinanju!? Not again...". The thought of my Sinanju FWS immediately came to my mind and I ask myself whether I can better this one (even though there are improvements to be made). I love a challenge and agreed to it. 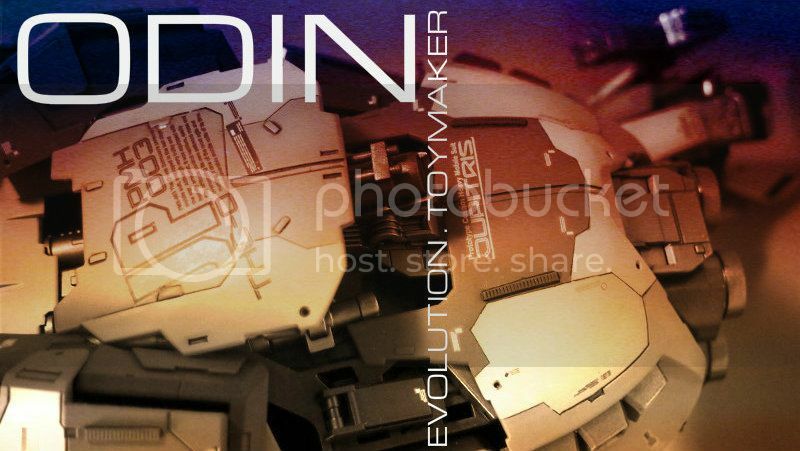 For our first proper discussion, the main agenda was creating variations of the Sinanju. 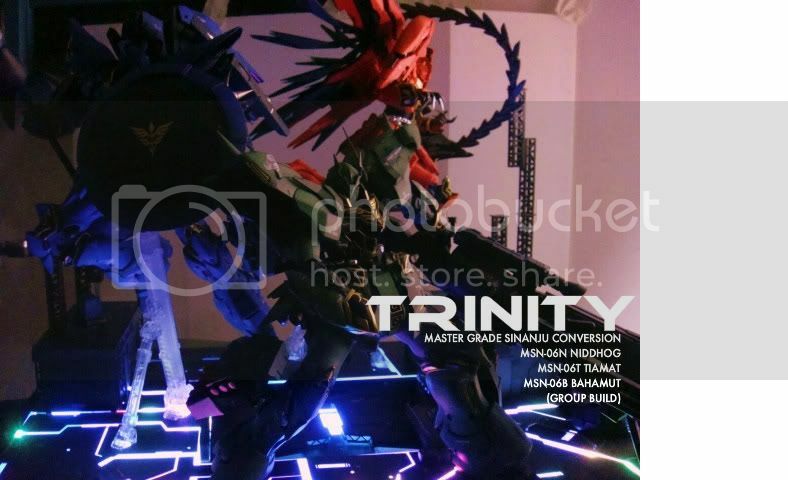 We know that it is a risk to alter the design of the Sinanju as many people deem that its design and shape is "unbreakable" and I can understand that very well. While we are not necessarily trying to prove a point, we could at least try to change mindsets along the way. Nothing is impossible after all. Leon wanted a Sinanju that is "highly charged" and wanted a "knight" version, complete with a shield and a beam lance. And he chose purple as this colour symbolize Good Judgement and Royalty (hmm.. judge who?). As for me, when I was told to do the high mobility type, I immediately think of wings. And on top of that, a fast attacker will strike fear in opponents, so I want a really menacing look. Something like the Epyon Gundam in the Wing series. I chose orange for this kit. I was thinking since it is so fast, might as well paint it like a Lamborghini LOL. Erik is our in house electrician and in charge of the base. He installed the LEDs and programmed them to switch color. Sam is our QC inspector. He dealt with logistic aspect of the project and was also involved in painting the kits. While we want to differentiate the three kits from each other, we want to see consistency too. We decided that the emblems will stay since it is the common marking. We also custom made decals for the Trinity team as well as individual markings. With the main issues solved, the base was our next obstacle. The maximum dimension allowed was 50cm wide, 50cm high and 38cm for depth. It may seem huge but if you put three Sinanjus will fully maximize the space. 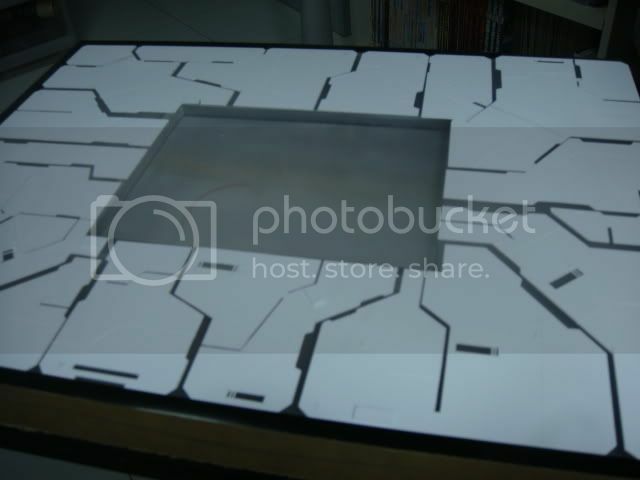 Leon wanted something really eye-catching and proposed adding LEDs to the base. We brainstormed and settled for a mechanical base with lighting underneath. It sounded kinda weird to us initially, lighted up base? In the end, it exceeded all our expectations. Of course, not everything went smoothly, we had problems with colours and other issues but managed to resolve them. Just to get everyone down in one place is a tall order. It is harder to coordinate as a team compared to an individual. But the satisfaction I get when things get done as a team is immensely gratifying. And a special thanks to Benjamin / Izzakku for his expert advice on presentation and posing. He was with us all the way and we had a great time together! Well, I could make you guys sit through another few pages and talk about my boring story or I could just show you the pictures. I chose the latter :) Lots of photos ahead! Ok I decided to make you guys read this, a very impressive story written by my friend, Yihui who happens to be the maker for the below entry at Singapore BMKWC 2010. I have created a page for tools and supplies that I use in the course of modeling. Some of the methods that I may describe will be based purely on experiences I amassed over the years. I always believe that there is no right or wrong methods/ techniques to apply. As long as it works for you, it's fine. And if I came across interesting tools or spare parts, rest assured that I will recommend them here. And if you do not agree with me on some of the write-outs, feel free to write or reply to the relevant post. I am not perfect and still learning so I am open to all suggestions. Hope this will be the start of a new "partnership"! Ever since I started doing Gundams, I have been using Taimya side cutters. They are probably the best available in the market but you have to pay a premium for it. Hence when I was asked to test this pair from Hobbymate, I was quite skeptic about its performance. Imagine my surprise when I tried cutting a part of plastic. It slices through with minimum effort. In fact, I need more effort with the Tamiya cutters. The handles gives you a better grip. And after two months, there is no signs of oxidation or tarnish. So far after 5-8 MGs, it still remains sharp, I will continue to monitor though. At 28 bucks, I think it is a good buy and for those who do not wish to pay more than 40 bucks or more for the Tamiya cutter, your solution is right here. It's already a week into the 2011. Everybody has already set their new year resolutions. As for me, I do not have that practice. But I thought it may be better to write about my thoughts for 2010. This blog serves as a diary to me after all. The highlight of this year is of course the arrival of my daughter, Ashley. I am never complete without my family. It has been a difficult three years for me ever since my mum left me and it still is. But this wonderful addition brought some colours back into my life. Parenthood is never a bed of roses but to me, this is where boys become men (for me at least). You will never understand YOUR parents until you become one yourself. My son has started his primary school education and I just realized that it is easier to convert crocodiles to vegetarians than to make him do homework. Alas! The many challenges of being a parent. As most of you should know by now, I have a day job. And to juggle between family, career, hobby and blogging is no easy task. I am blessed with a very understanding wife who not only approved my hobby (my hoarding), but share my passion as well. It can't get better than this. Without her, I will not be able to continue churning out works year after year without distractions. And she doubles as my QC inspector for my finished works. Career-wise, I am still doing ok although I think I need to work harder, maybe as hard as I do my Gundams lol. Ultimately, it is not about how good your Gundams are but whether you are able to put food on the table everyday. I do admire and envy those who are able to turn their passion into careers. It will be a dream come through for me. Now my report card in terms of this hobby. I thought I did pretty well last year. I can't believe my luck in winning the mid-year competition and then repeat the feat in Hong Kong for the Group Category. Of course, my superb team mates played a major part. And not to mention the full support we received from HAG for the project. These are FRIENDS you cannot do without. I'm just glad that I have the right people with me. And after countless competitions and awards, I ask myself should I be taking my foot off the pedal? But where is the fun in that? I love the challenge that a competition offers me. But rather than trying to aim for honors every time, maintaining or improving my standard is my priority now. So I don't see myself stepping down any time soon. I always tell myself my latest work must be better than the last one. It is a tall order but at least I have a target to strive for. After all, you are your worst enemy. And I bet some of you are wondering why the lack of Work-In-Progress pictures in here. I apologize for that. But I do not have the habit of taking shots during construction stage. I find it a hassle. But now I think I need to change that. I owe you guys that much:) When Mr Ferry asked me how I combined the backpacks of the Sinanju, I had difficulty explaining without pictures. And thanks to the picture offered by Mr Mabheq (you are a lifesaver) and Ferry's patience, I was able to offer some decent explanation and hopefully, did not disappoint anyone. I am beginning to realize the importance of W-I-P shots and all the talk about sharing will come to nothing if i do not show how I made those parts. This is one area I must look into this year. And last but not least, PG Strike Freedom! For those of you who asked me questions and I have missed out, I apologize in advance. You might want to send "reminders" to me. I have repeatedly answer the same questions posed by the readers here and frankly, I DO NOT mind answering them again. But I do appreciate if you guys can do a bit of research on the relevant subject before posing your questions. That way, you will understand my explanation better. And I encourage you guys to share with me your latest works in my facebook. I always tell others if you want to learn Gunpla, learn to take criticisms first. Because the day you learn to accept criticisms will be the day you start to become a real modeler. And finally, I need to thank my wife, Mr Leon (To put it simply, no him,no Toymaker), Joyce, Sam, Erik, Benjamin and the whole HAG gang especially. We been through ups and downs. The group build, the disagreements, the fights and sometimes, we have to put up with the yapping and nonsense of some JOKERS. But hey!! We survived!!! And this year will be better!!!!!!!!!!! 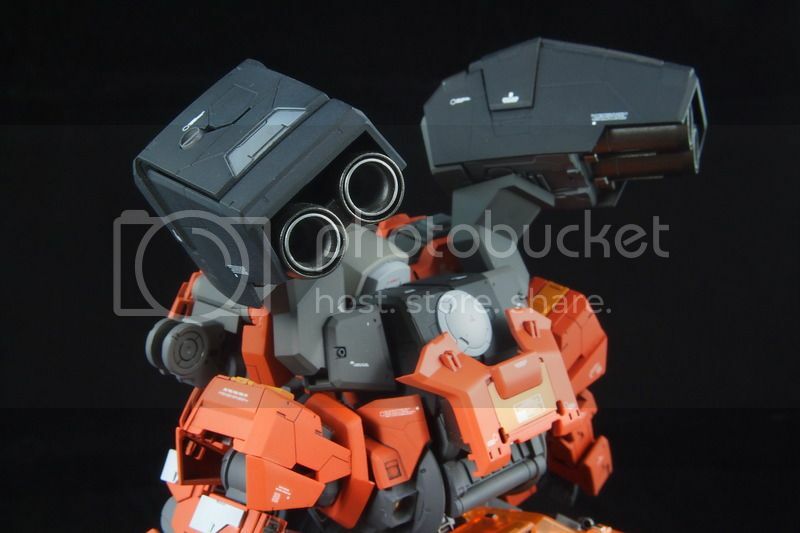 After my Sinanju FWS, I have received a lot of queries on how I attach another set of thrusters to the back. Well, I went through my photos and realize that I do not have any WIP pictures to explain. Luckily, I have a young friend who manged to do just that and I "borrowed" a picture from him for reference. As I am doing more kit bashing lately, it is hardly surprising that I buy two of the same kit at one time. Thanks to mabheq for this picture. As you can see, the top part of the backpack was cut out and then glued to the other back pack. I used pins to secure the both of them. Well, there is hardly anything for me to say since the picture above will speak for itself (I think). Let me know if you guys still need clarification. It's a new year and I am hope that this year will be as exciting as 2010. The local gunpla scene is warming up nicely. I see more people moving on to painting their kits which is very encouraging. Bandai seems to intensify their marketing strategy here and to me, it is a good thing. I am already looking forward to this year's Gundam Fiesta. What is my resolution for this year? Simple, build more Gundams. 5 Kits in 2009, a miserable 3 in 2010. That is one statistic I want to improve. Looking at my report card for this year, I must say I have been lucky. I was pretty happy after winning the mid year competition, but coming up top in the Group Category in BMKWC Finals @ Hong Kong was the icing on the cake. This win motivates me to improve myself further in terms of techniques and concepts. Anyway, I wish everyone here a Happy New Year. May all your wishes (and mine) come true!!! !